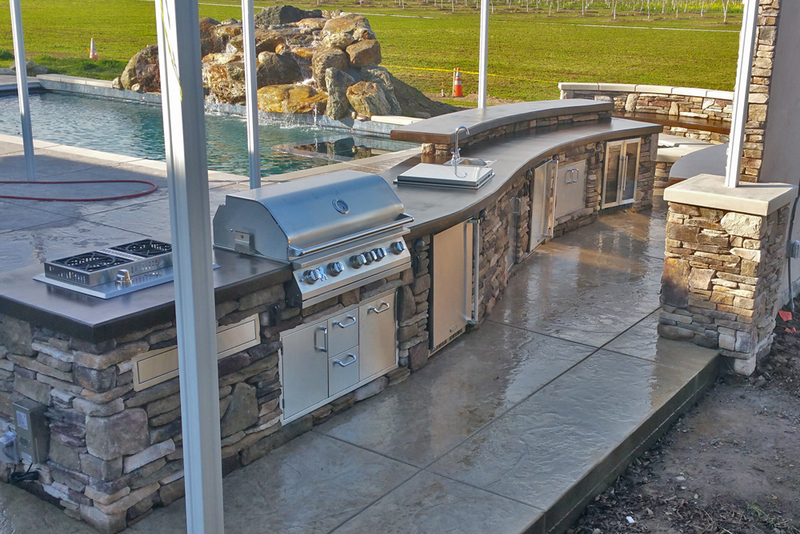 This El Dorado Stone Vanier Outdoor Kitchen with Hardscape Design Firepit, Hardscape Designed Seating Area, TV Mounted Custom Hardscape Design & Luxury Outdoor Seating and Dining Bar has everything you need for the ultimate in luxurious relaxation and entertainment. 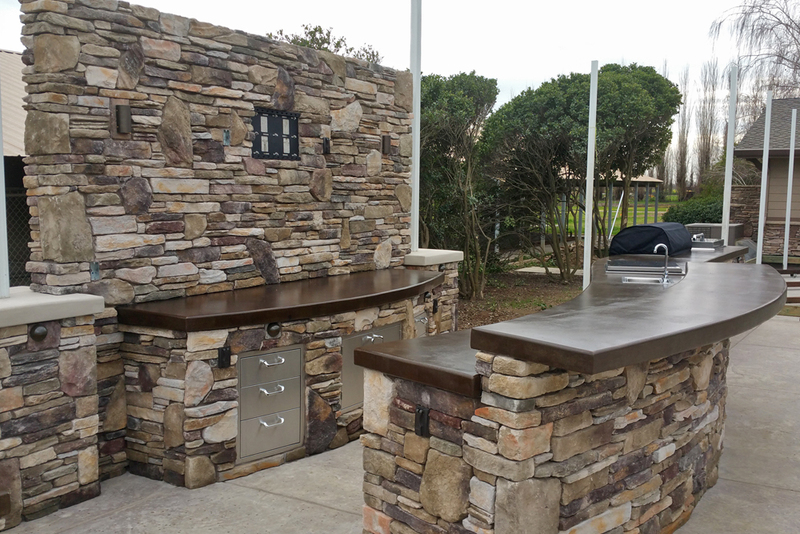 Whether you are looking for the ideal way to entertain guests in style or just wanting a comforting, luxurious place to relax with your family after a long day, this outdoor kitchen has it all. 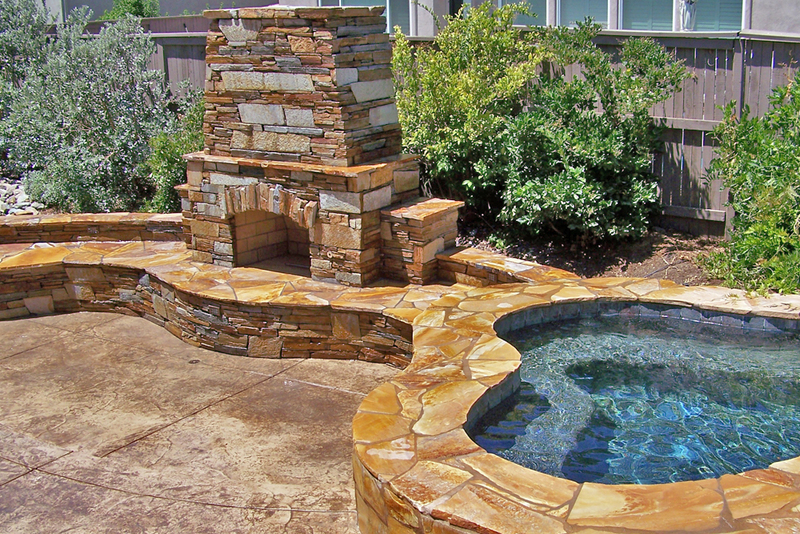 Imagine sitting on the built in bench, warming your toes at the merrily crackling fire in the fire pit, and then going and jumping in the pool when you get too hot. 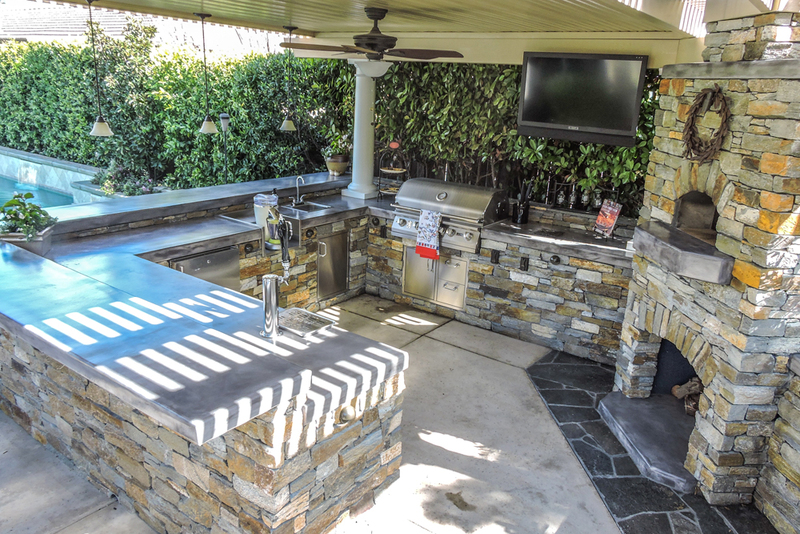 Meanwhile, there are steaks cooking on the barbecue and your favorite show is on the outdoor TV, giving the whole evening the perfect atmosphere. 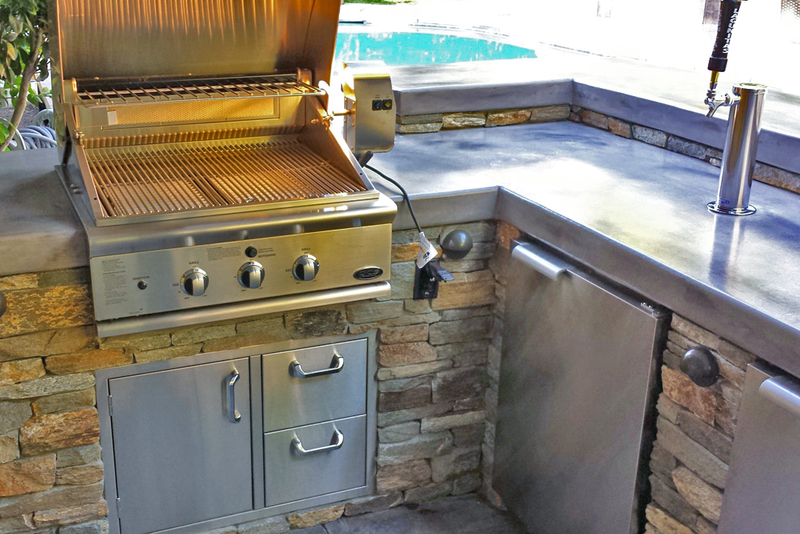 When the food is done, you pull a cold beverage out of the outdoor refrigerator and pull a chair up to the outdoor dining bar, where you can enjoy a delicious meal in the great out of doors where the comfort of your fully stocked outdoor kitchen is matched only by the glorious sky that serves as your ceiling. 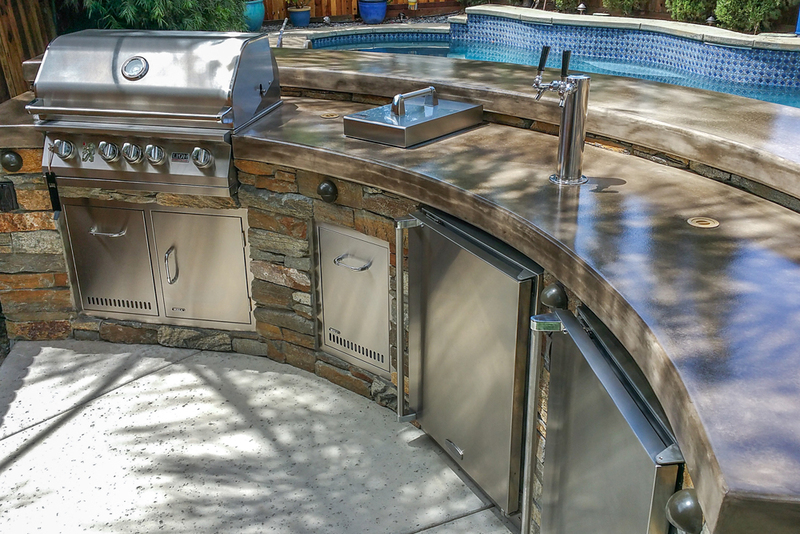 With an outdoor kitchen and hardscape setup like this, the only question would be whether you would ever go inside again. 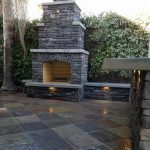 The outdoor TV is the really surprising element in this design, since it is generally accepted as common knowledge that electronics and rain do not mix. 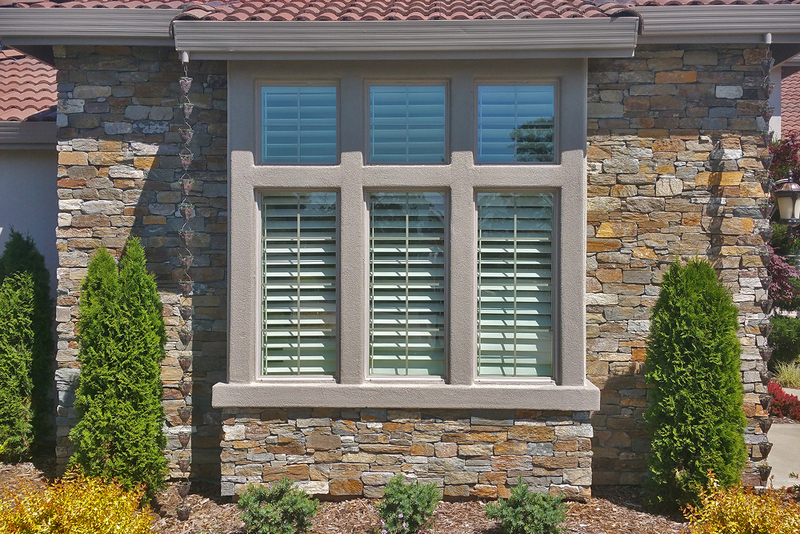 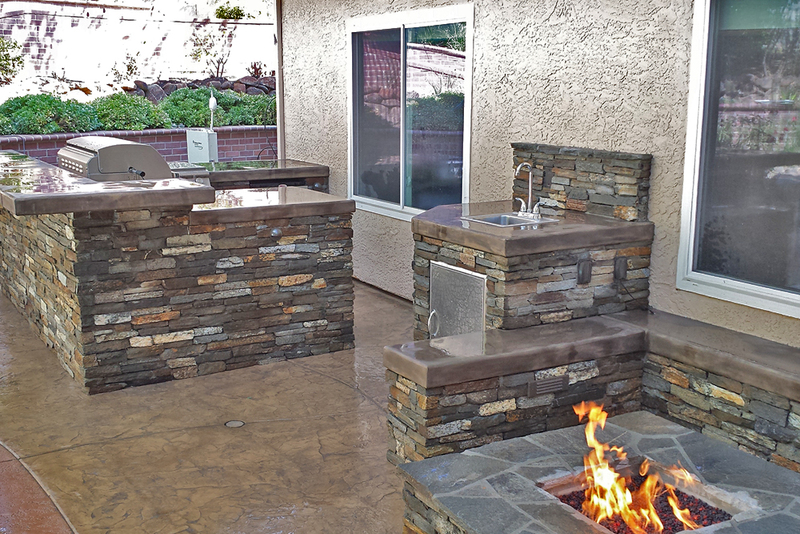 However, with our installation and equipment, you can enjoy watching shows or listening to music outdoors any time. 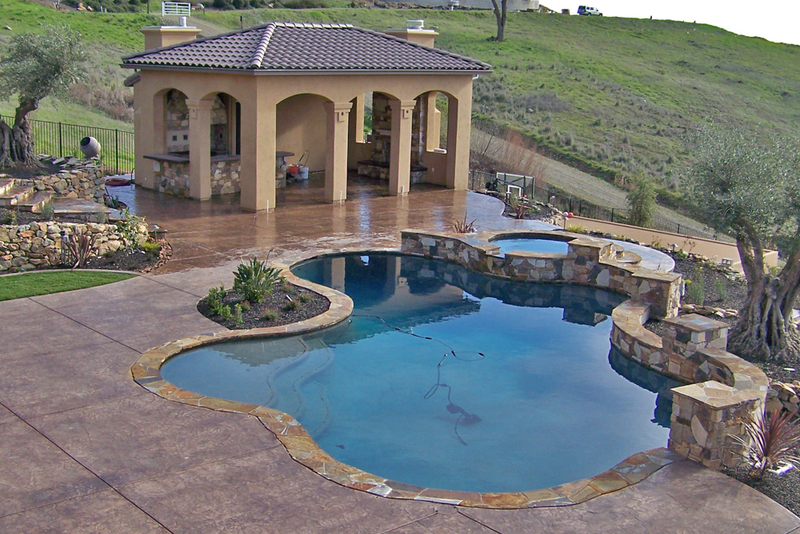 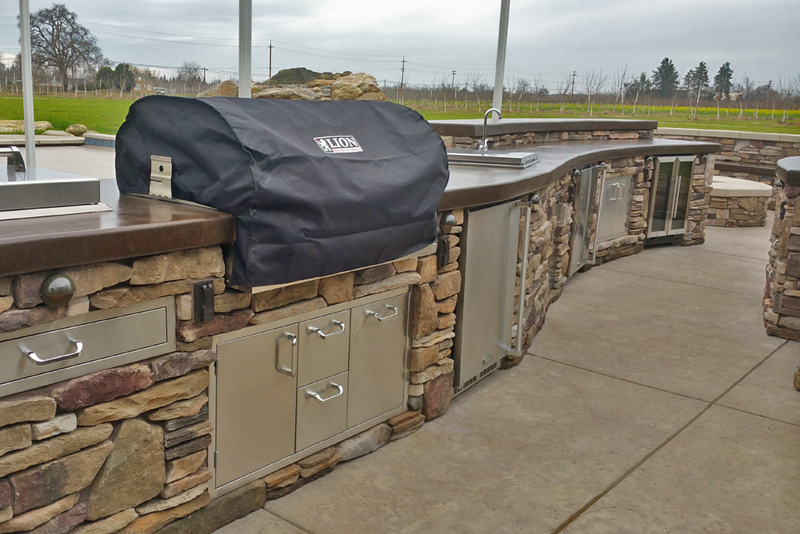 The long luxury outdoor kitchen is the ultimate in usefulness and practicality. 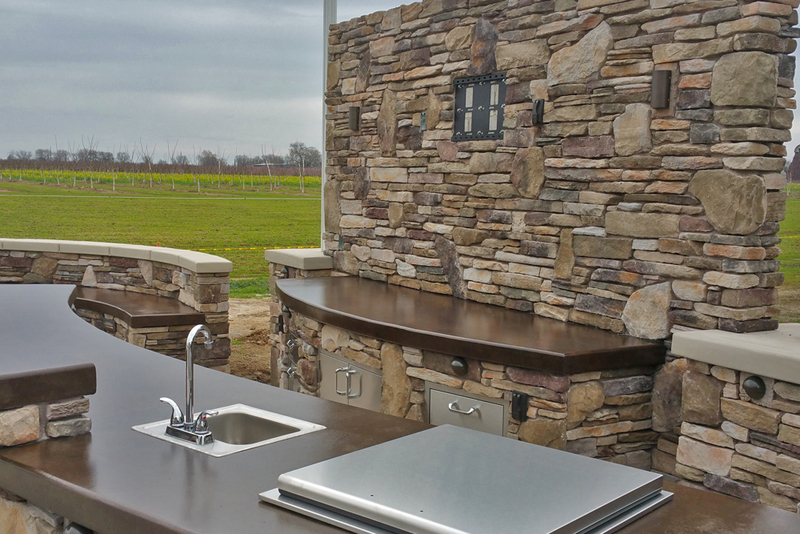 It features all the amenities you would expect from an indoor kitchen, but organized and designed for outdoor use. 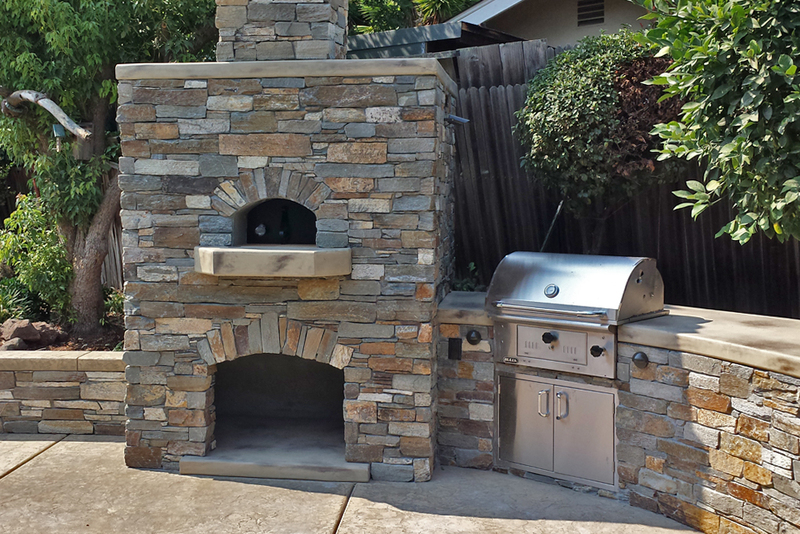 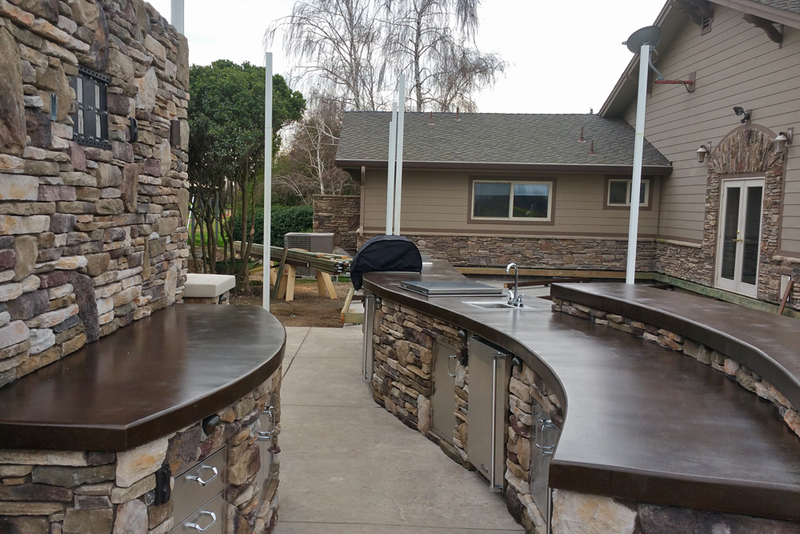 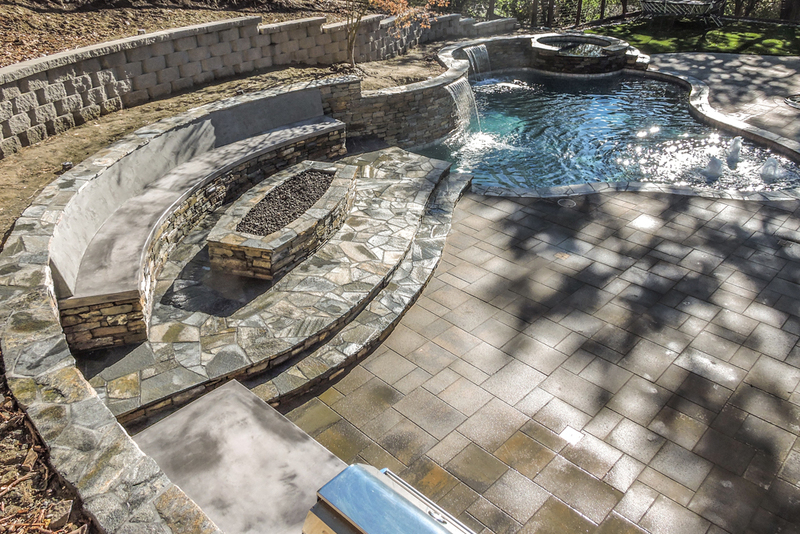 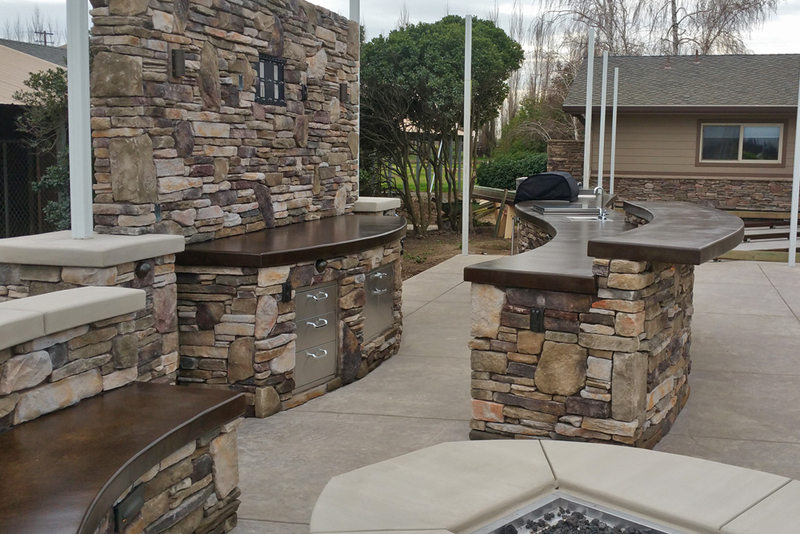 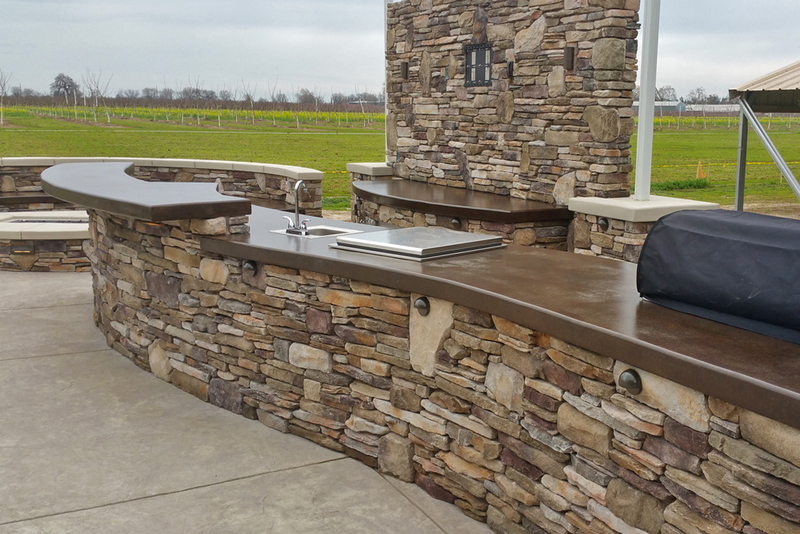 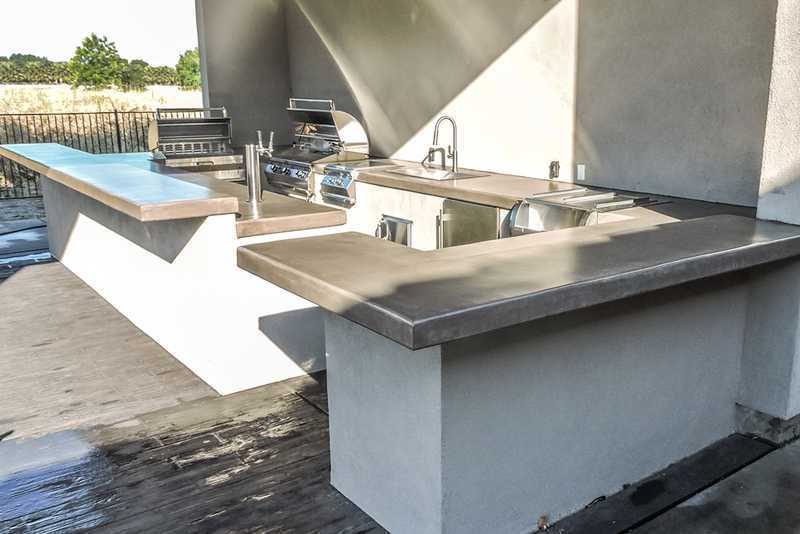 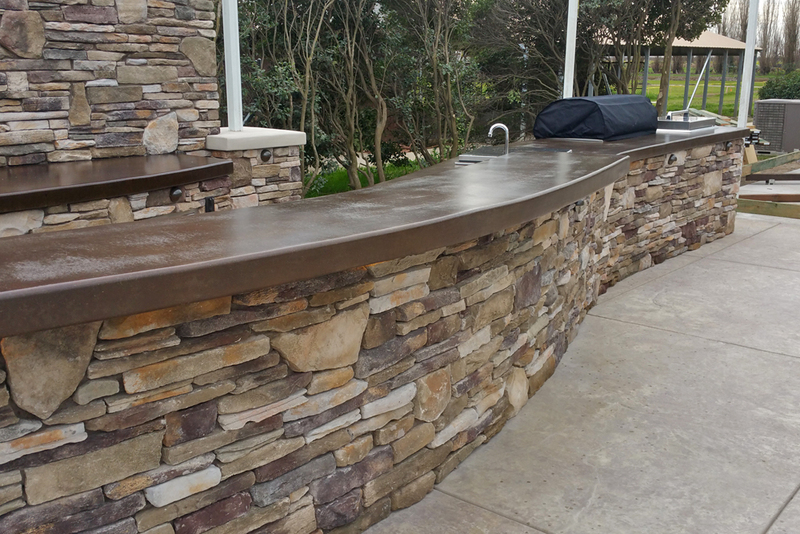 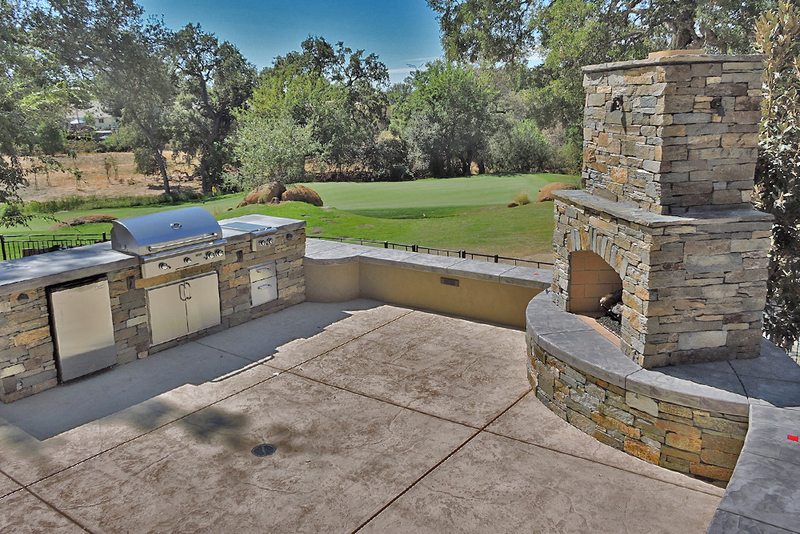 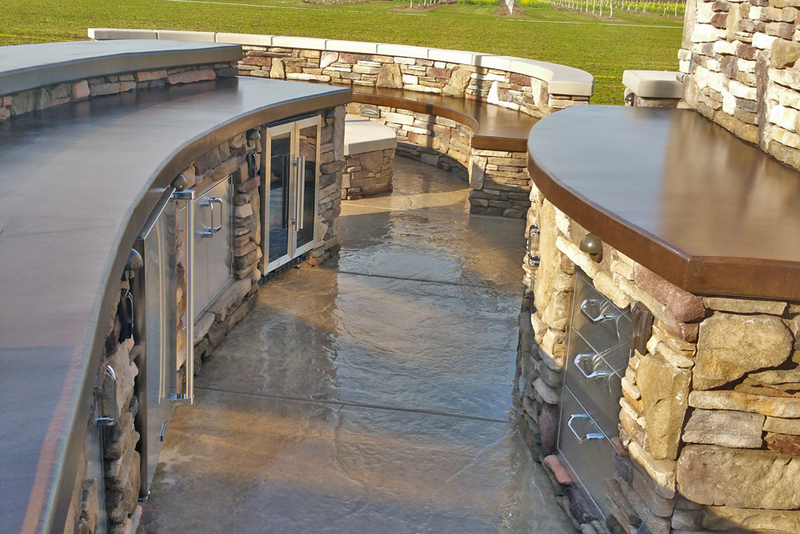 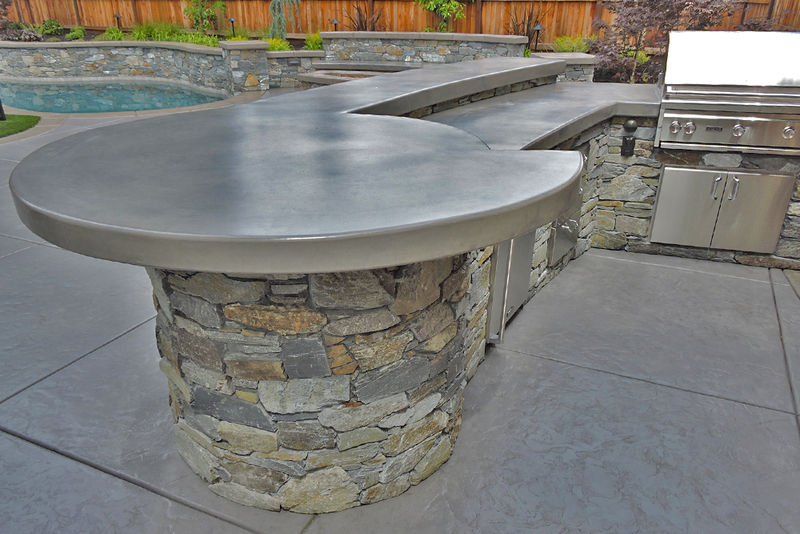 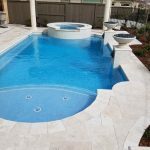 Whatever kind of meals you want to prepare at your Sacramento home, this gorgeous outdoor kitchen from Custom Image Hardscape can make it happen. 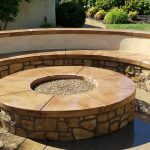 The fire pit is an interesting change from the commonly expected outdoor fireplace. 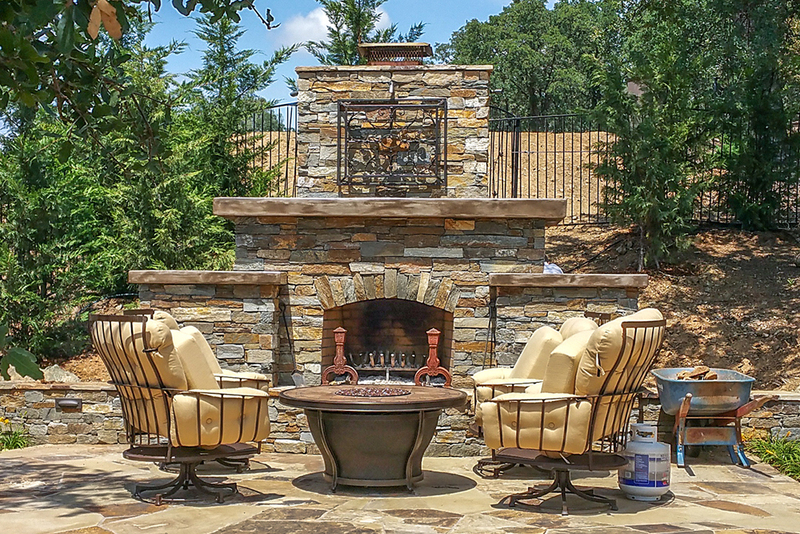 With a fireplace, people can enjoy it from one side. 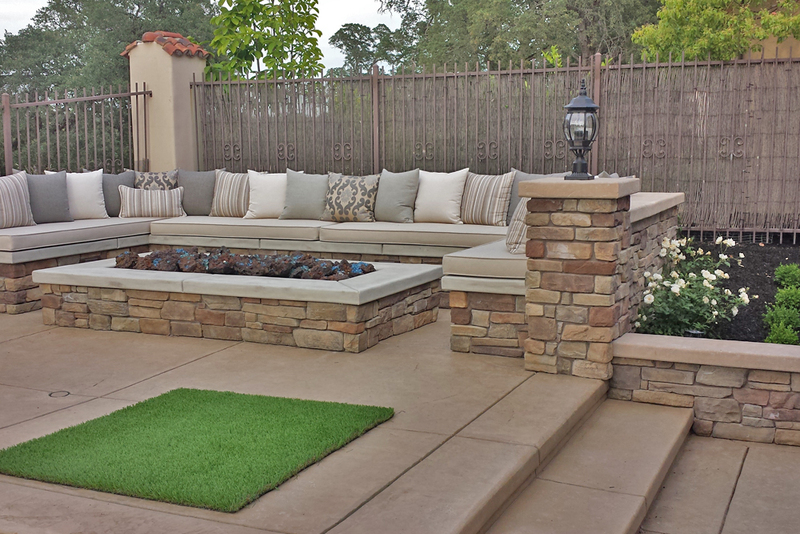 It gives the feeling of a living room, even when it is outdoors. 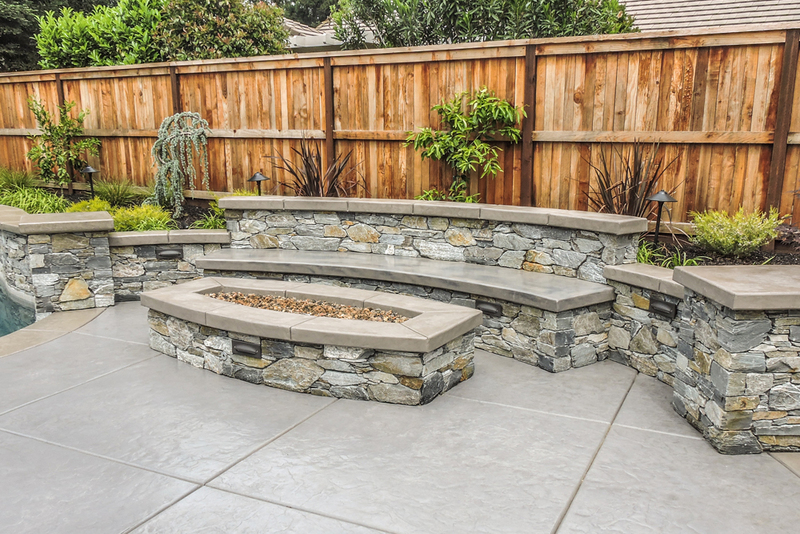 But with a fire pit, people use it from all sides. 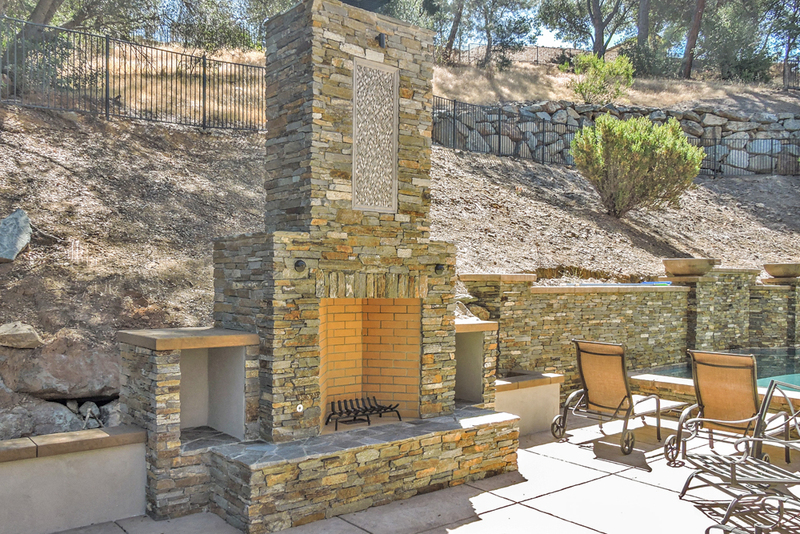 And the feel that it gives the area is more along the lines of a campfire than an indoor fireplace. 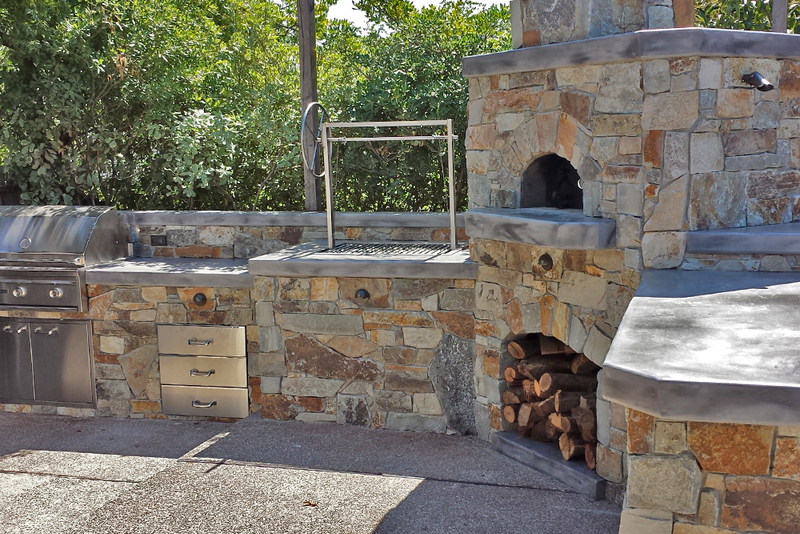 The unique design of this outdoor fire pit means that it can equally be using for cooking foods as for enjoying the ambience of a fire. 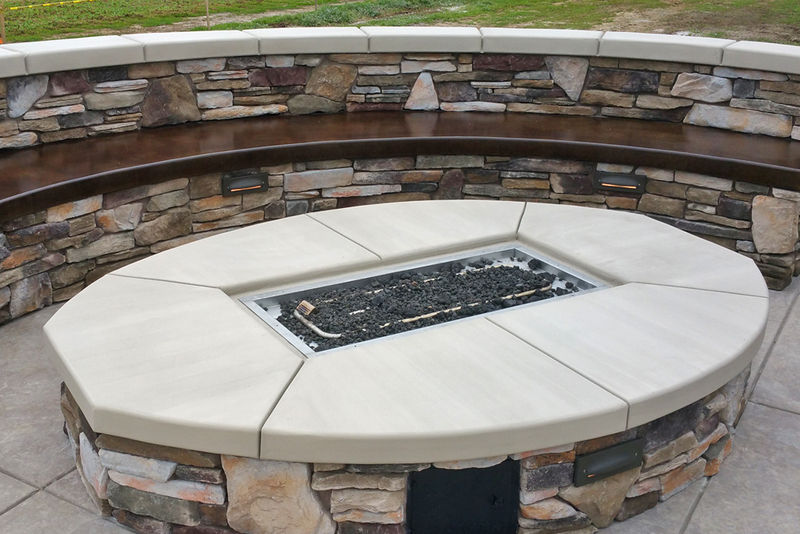 So whether you want to tell spooky stories around your (civilized) campfire, roast marshmallows and weenies, or both, you can with this gorgeous custom hardscape from Custom Image Hardscape.